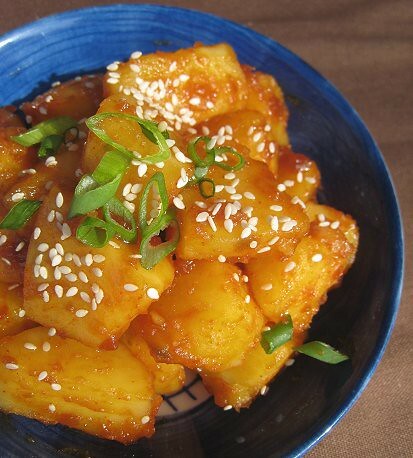 We still had some Yangnyeom Sauce leftover from our Korean Fried Chicken, so we thought to glaze some sweet potatoes. 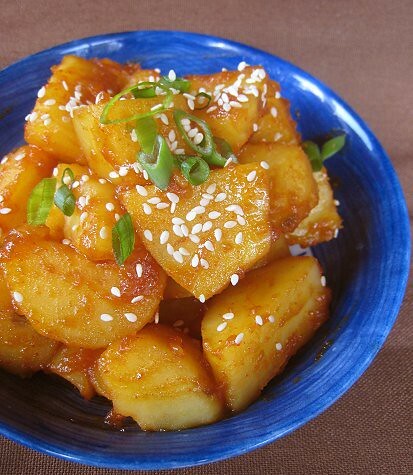 Simply cook some peeled and cut sweet potatoes -- we steamed ours, but one can easily roast or boil them -- and then toss in Yangnyeom Sauce. This was finger-lickin' good -- that is, if you were like me and just grabbed a piece with your fingers every time you passed by the bowl. In fact, JS liked the sauce better on the sweet potatoes than on the fried chicken! We definitely didn't make enough, having cooked only five sweet potatoes. Now THIS is what I'm talking about. I am in awe. Never too many sweet potatoes in MY life! Wow, this look delicious. I'm amazed on how you girls take us on a world tour of food. You dont just specialize on Filipino-Chinese cuisine. Good work! 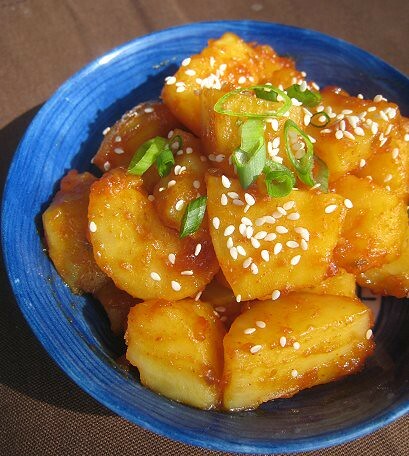 Oooh I love these Korean potatoes! I know they're supposed to be a side dish but I always ask for extra and end up eating this as almost my main meal lol. These look awesome! Just eating sweet potatoes AS IS, without anything on it, is already good!